The first European Pair Go Championship (EPGC) was held in Amsterdam in 1995. Since 1997 it has been a regular event, hosted by a different country each year. So far it has been in France, Netherlands, Czechia, Bosnia, Poland and Romania. The 2005 EPGC was held at Hitachi in Maidenhead. Typically teams from about 15 countries take part. Since 2004 they have been competing for points, as well as prizes, to allow their country to qualify for the World championships. The official UK representatives at the EPGC are selected on a points system based on the Pair's results at the British Pair Go championships. Their results are also listed. 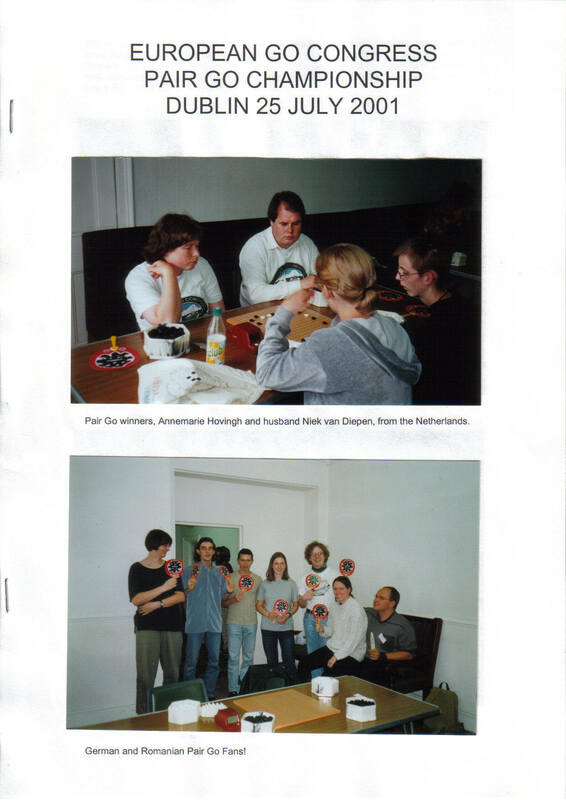 Since 1992 there has been a Pair Go Championship at the annual European Go Congress. This was usually a friendly event with handicap games and lots of entries, even though it was held on one of the days off from the main event, but in 2011 became more serious with prize money.